A couple of Fuzz pedals I have been working on. Its safe to say I love me some Fuzz! The Cerberus is a ‘3-in-1’ pedal with Octave, Fuzz, and Tone circuits. All three circuits can be switched in and out of the signal path for a variety of tones. I find this a cool circuit to play around with, and it covers a wide range of fuzzy requirements. The Octave circuit is the classic Green Ringer circuit. It can verge between clean octave tones (especially when playing with a neck pickup above the 12th fret) to glitched out, ‘my guitar is having an aneurysm’ mayhem when playing chords etc. 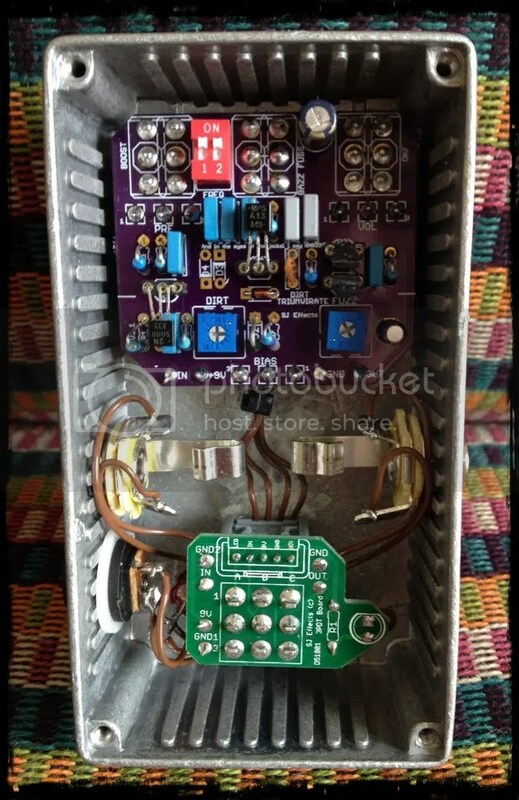 The Tone circuit is the classic Big Muff Pie tonestack, with a standard recovery gain stage. There is also an internal trimpot to set the level of mids (from scooped to boosted). The Dirt Triumvirate is a ‘3-in-1’ pedal with 1 Boost and 2 Fuzz circuits. All three circuits can be switched in and out of the signal path for a variety of tones. The boost circuit is based upon the classic LPB1 circuit, with an internal DIP switch to switch between treble, mid and full range boost. The Fuzz1 circuit is the classic Bazz Fuss. This is a really cool sounding circuit and can provide a variety of cool tones. The Fuzz2 circuit is based on the Coloursound One Knob Fuzz. Its fair to say I am a big fan of this circuit! 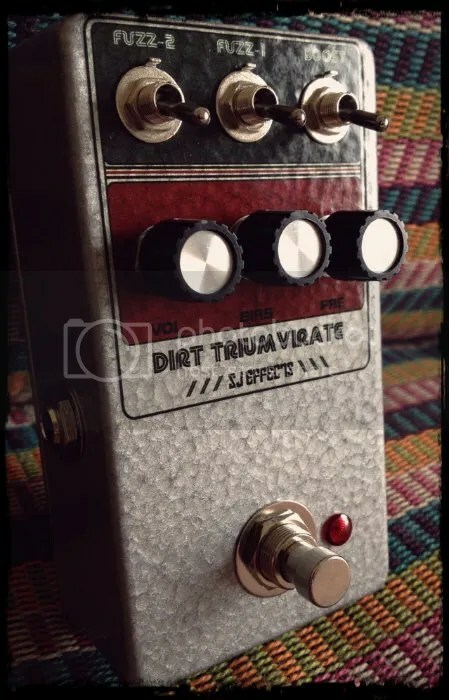 Depending on control settings the Dirt Triumvirate can go from a nice crunchy overdrive to all out Fuzz chaos (noise, feedback, oscillations, etc.). 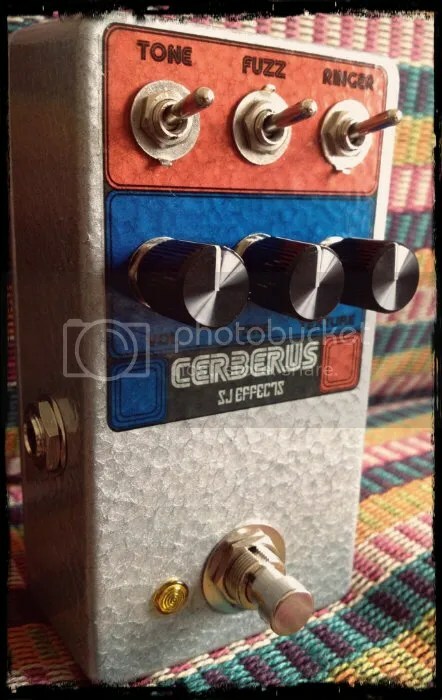 The Cerberus Fuzz is one of my ‘standard’ pedals (ie. not custom). If you want one building please get in touch; its a really cool circuit with lots of (Fuzzy) uses. I will also be offering PCB’s for the DIY’ers out there. If you would like more info just get in touch. 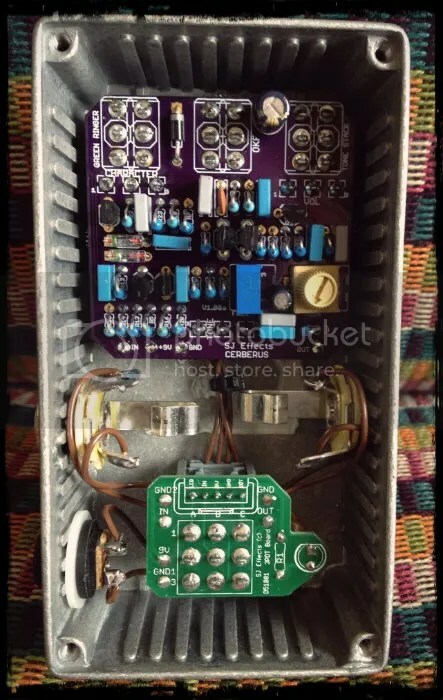 This entry was posted in Uncategorized and tagged custom fuzz pedal, custom guitar effects, custom guitar pedals, fuzz pedal, one knob fuzz by sjeffects. Bookmark the permalink.